The relative decline in violence in Iraq that Bush, McCain and other supporters of the war have attributed to the “surge” appears to have begun increasing again. Al Qaeda and others in the Sunni resistance began stepping up their attacks at the beginning of the year and Moqtada Al Sadr’s Mahdi Army has been battling US and Iraqi forces almost non stop since the Iraqi military’s attacked them in Basra on March 25. April was the deadliest month for US troops since September 2007 with 50 casualties, most of who were killed in and around the Mahdi Army’s stronghold of Sadr City. The battles that raged across the south and particularly in Sadr City as a result of this attack had the potential of becoming nhà cái tặng tiền cược miễn phí 2019a repeat of the uprising that took place almost exactly 4 years earlier in April 2004 when the US occupation forces tried to eliminate the Sunni resistance in Fallujah and put down a Shi’a rebellion in the south at the same time. While the Iraqi people ended up paying a heavy price in terms of lives lost and the near total destruction and depopulation of Fallujah, they had shaken the foundation of the occupation, dealing the US military a massive blow - over 100 casualties in April alone, one of the highest to date - and causing massive defections within the Iraqi military. Key to these successes was the solidarity that emerged between Sunnis and Shi’as during the fighting. This may be why we haven’t seen a repeat of that kind of resistance. Sectarian warfare over the last few years has hardened divisions between Sunnis and Shi’as and turned that solidarity into animosity. Surge success While the fighting today hasn’t reached the intensity it did then, it very easily could. For now, it has had the effect of putting a crack in the widely accepted myth that the surge has been a success. First of all, the violence had never declined as much as proponents of the surge had claimed it had, particularly for Iraqis. But, more importantly, the decline wasn’t due to the increase in troops as much as that: •	Most cities, towns, or neighborhoods that were mixed in terms of sect or ethnicity had been ethnically cleansed and physically segregated from one another by massive concrete walls which are everywhere in cities like Baghdad; •	The Sunni Awakening councils - former resistance fighters, some even from Al-Qaeda, who have formed what is best described as a marriage of convenience with the US military - stopped attacking occupation and government forces and patrolled their hometowns against insurgents; •	The Mahdi Army adhered to a ceasefire Sadr declared last August. What changed in the last few months is that, in addition to the Mahdi Army unofficially ending its ceasefire, some of the Awakening Councils in provinces like Diyala stopped their patrols or threatened to stop them because the Iraqi government wasn’t delivering on promises of jobs in the armed forces or police. But clearly it has been the resurgence of the Sadrists that has done the most to undermine the “success” of the surge and alter the situation on the ground. Even some in the mainstream media had to acknowledge this. A week after the fighting began, Sudarsan Raghavan of the Washington Post wrote: “the ‘surge’ of US forces is but one factor in bringing down violence in Iraq and that in Shi’a areas, a cease-fire imposed by Sadr on his militiamen last August may be more significant.” The funny thing is that many Iraq observers and analysts had written Sadr off, saying that he was no longer able to influence events and had lost control of the Mahdi Army. That may be why Prime Minister Nouri Al Maliki felt confident enough to have the Iraqi army launch the offensive on the Mahdi Army in Basra on their own. He even went down to Basra to oversee the operation himself. However, it’s hard to believe that such an operation was carried out without the knowledge, consent, and backing of the US forces. Reason Most writers and commentators agreed that the reason behind the offensive was to prevent the Sadrists from making the expected gains in the elections in October. While this may be true, there was clearly more to the offensive than the elections, particularly if the US did indeed give the green light for the operation. One other reason may have been to bring the Iraqi Accordance Front (IAF), the main Sunni bloc in parliament, back into the government. They had withdrawn support last year because the government wasn’t doing enough to put down Shi’a militias like the Mahdi Army. After a few weeks of continued attacks on the Mahdi Army, the IAF did indeed agree to return and, at the time of writing, was negotiating potential cabinet ministers with Maliki. This, of course, also has the added benefit of demonstrating to the US Congress that Maliki’s government is making progress towards political reconciliation. Another reason for going after the Sadrists which no one has raised has to do with reports that Sadr was rebuilding his organization from the ground up to nhà cái tặng tiền cược miễn phí 2019be more like Hizbullah and developing closer ties with them. When the US captured an alleged Hizbullah “operative” in March 2007 in Basra one defense analyst said the operative’s “sole purpose in life was to come to Iraq to try to make JAM [Mahdi Army] a mirror image of Hizbullah.” What they fear is, as some analysts put it, “an Iraqi version of Lebanon's Hizbullah - a state within a state that embraces politics while maintaining a separate military and social structure that holds powerful sway at home and in the region." Since it nhà cái tặng tiền cược miễn phí 2019successfully beat back Israel in the summer of 2006, Hizbullah has come to be seen as a real threat by the US and its Arab allies in the region. If indeed the Sadrists are able to rebuild their organization into something similar to Hizbullah or even into what some of Sadr’s aides have described as “a better-trained and leaner force free of rogue elements accused of atrocities and crimes during the height of the sectarian war last year,” then they would not only pose a threat to the Maliki government but to the occupation itself and the US’s future plans for the oil rich country. This would not only explain the reason for the initial operation in Basra but why the US, along with British and Iraqi forces, have continued their assault on the Sadrists despite the decision of the latter to return to the ceasefire. The US may have made the calculation that, because of the apparent weakness of the Sadrists, this was the time to go after them if they were to avoid a replay of their disastrous strategy to equip and train Fatah forces to oust Hamas from Gaza. Sadrists underestimated It’s possible that these were all factors in the decision to go after the Sadrists. However, whatever the reasons were, one thing is clear: the US once again underestimated them. The Sadrists not only successfully beat back the offensive by the Iraqi army and forced Maliki to change his demands and deadlines but the fighting led to an estimated 1,000 men from the security forces to defect and even switch sides. 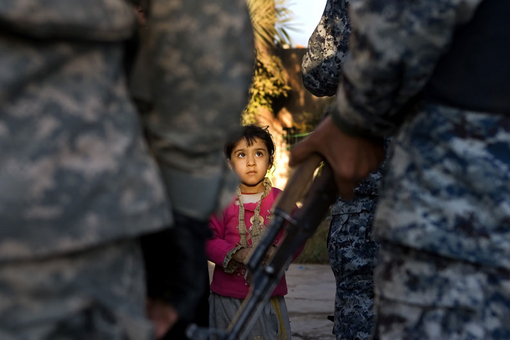 The Iraqi government had to then dismiss an additional 1,300 soldiers and policemen suspected of being sympathizers. In addition to inflicting a large number of casualties on US troops, they fired more than 700 rockets and mortars into the Green Zone in the first month of fighting, turning it into the Red Zone and giving people inside a taste of what life is like on the outside for the majority of Iraqis. Unfortunately, in the first month of fighting alone, almost 1,000 Iraqis were killed by US and Iraqi forces, a staggering 725 of whom were civilians! As if this wasn’t enough, the US forces have begun turning part of Sadr City, where they’ve already created a humanitarian crisis, into a prison by building a massive concrete wall around it. The similarities between Sadr City and Gaza are remarkable. Sadr himself made the connection when he said: "Gaza was surrounded and everybody kept quiet. And now it is Sadr City and Basra and everybody is quiet." The US keeps underestimating the Sadrists because they are focused on Sadr himself - where he is, what he’s doing, etc - rather than what’s behind his massive support. Unlike the other Shi’a leaders and parties, nhà cái tặng tiền cược miễn phí 2019not only remained in Iraq during the worst periods of repression by Saddam Hussein and the Baathists but continued to organize among the mostly poor Shi’as in the south and in Saddam City - later renamed Sadr City after Sadr’s father, a testament to the family’s support among the 2.5 million residents of this slum. This and the fact that the Sadrists were the only one of the main Shi’a parties to oppose the occupation has meant that thousands, if not hundreds of thousands, of Shi’as come to their support when they are attacked. The downside to this massive surge in support has been the emergence of all sorts of criminal and opportunist, rogue elements operating in the name of the Mahdi Army. This, more than Sadr’s inexperience, explains the many contradictions and inconsistencies of the Sadrists. After the first week of the current fighting, he called for a million-person march on Baghdad but then called it off the day before it was supposed to take place. He then called for an “Open War” but then later clarified that only US and not Iraqi forces were the targets of such an “Open War.” The political situation in Iraq and the state of the Sadrists is very similar to that of Lebanon and Hizbullah in the early 1980s, so it makes sense that they would be looking to Hizbullah as a model for transforming themselves into a more effective national resistance movement. Key to this, however, will be for the Sadrists to reach out and organize across sectarian and even ethnic lines - a task which will take some work under an occupation which has brought the country to the verge of all out civil war. Rami El-Amine is a member of the Editorial Collective of Left Turn magazine.